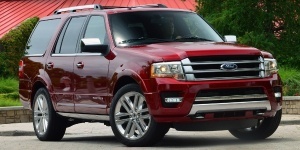 The Ford Expedition is powered by a 3.5L twin-turbo V6 and offers seating for up to eight. An extended wheelbase version with expanded trunk space is available, as is all-wheel-drive. The Ford Expedition carries over to 2017 virtually unchanged. Find the used Ford Expedition of your choice from a dealer in your area. Search our used car listings now.